Orchestra students are preparing to express a more individual side of their instruments at the solo and small ensemble music festival at Mexico High School this Saturday. Students will compete to qualify to the state music festival, orchestra director Alison Schmidt said. The amount of independent practice was a challenge freshman Ben Xu was more than ready to face. Xu will compete in both violin and piano solos. He will play Rachmaninoff’s “Etude Tableau Op. 33 No. 8” in G minor on the piano and “Sonata” in A Major on the violin. Xu hopes to make it to the state festival in April. To qualify, students will have to earn a score of one from judges, Schmidt said. The grading scale goes from a one being the highest score down to a five. Band competitions give students an opportunity to perform and compete in front of a panel of judges. The talent of band students will be on full display when they perform in Mexico, Mo. at the Missouri State High School Activities Association (MSHSAA) band festival Saturday. At the event, band students will perform solo or with an ensemble. 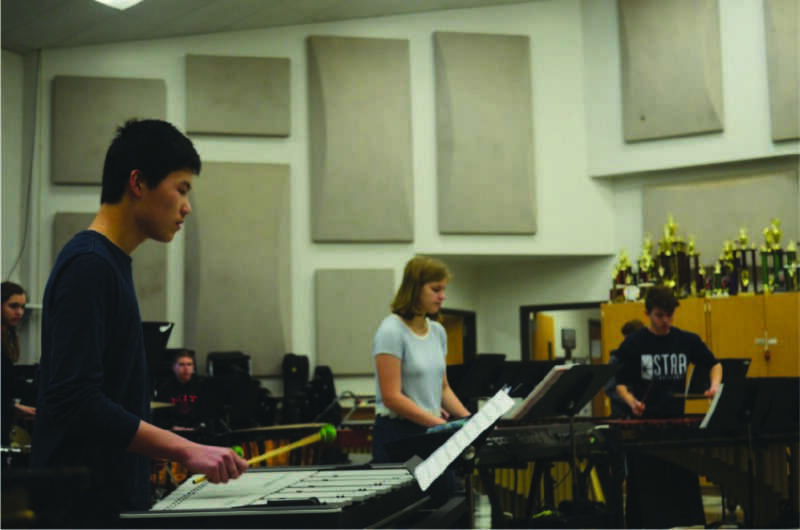 Students such as freshman Anthony Wu do both solo and ensemble. Students do not practice for MSHSAA competitions alone. Assistant Band Director Josh Myers helps students in both solo and ensemble to improve their performing skills. He gives students guidance and offers his expertise when students ask for help with things, such as tempo or changing octaves. Wu couldn’t decide whether he likes solo or ensemble performances better. For both types of performers, the pieces students play must come together perfectly in order for the individual or group to score well. Senior trumpet player Jackson Dampier acknowledges the importance of practice and repetition when perfecting a solo performance. Also a solo performer, junior Jordan Kuhnert echoes the sentiments of her peers by practicing at least an hour each day. Despite the heavy time commitment of practicing, students still find appreciation in the experiences that MSHSAA ensembles and solos bring. On the first Saturday of spring break, while most students will be enjoying their new-found freedom, RBHS choir students will perform at the annual district solo and small ensemble festival at Mexico High School (MHS) Saturday. Director Mike Pierson is excited to take 22 ensembles and 24 solos during his 27th year of going to the festival. Small ensembles began preparing for the festival at the beginning of February, and many students have worked on solos with private vocal teachers for months. The small ensembles are usually comprised of three to eight students and the groups can be unisex or mixed. Sophomore Jacob Jennings will go to the festival for his second time this year, where he will perform in a small ensemble as well as a solo. Likewise, sophomore Natalie Robuck, is going to the festival for a second time this year having done a vocal solo, violin solo and small ensemble last year. Robuck has sung in choirs since she was in elementary school, so she is no stranger to performing in front of audiences. Even so, there was a certain level of apprehension she felt before her first time going to district competition. Senior Alex Schust has left his nerves far behind as a veteran performer. He said he enjoys the choral music he gets to sing for districts and spending the day at MHS with his friends. For his last year, he will perform as part of a quartet and a double quartet. The first time he went, he found performing in a small ensemble intimidating, but after three years he highly recommends the experience. It must be stressful performing in front of other people, good luck! This competition was so fun! I got a one and will go to State in April.